This black sedan has a manual transmission and is powered by a 2.5L H4 16V MPFI DOHC Turbo engine. With that brawny motor it gets 14.3 L/100 km in the city and 10.7 L/100 km out on the highway according to Transport Canada. Our WRX STI's trim level is Sport-tech w/Wing Spoiler. 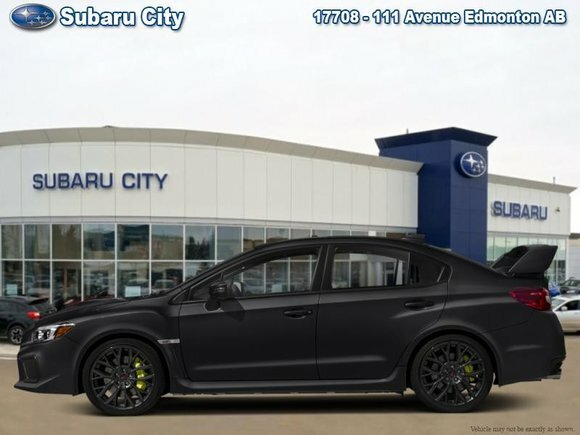 The highest trim for the WRX STI, this Sport-tech comes with a large wing spoiler and adds a 7 inch touchscreen infotainment system that includes GPS navigation, a premium sound system with a subwoofer, a proximity key with push-button start, and Recaro performance front seats. It also includes Apple CarPlay, and Android Auto along with dual zone automatic climate control, a 10-way power driver seat, Subaru rear and side detection system (SRVD) which includes blind spot detection, lane change assist, and rear cross traffic alert. This vehicle has been upgraded with the following features: Navigation, Leather Seats, Sunroof, Bluetooth, Rearview Camera, Heated Seats, Blind Spot Detection. Want to try the 2019 Subaru WRX STI Sport-tech w/Wing Spoiler?